No, the coffee isn’t made from poop. The cup, though, does look like a potty. Recently, website Seoul Searching checked out Poop Cafe in Seoul, near Gyeongbokgung Palace. Outside, the cafe doesn’t look too different from other trendy Korean cafes. Inside, the decor is poop themed—though, done tastefully. Well, as tastefully as you can do poop themed. It’s not as gaudy as Taiwan’s Modern Toilet restaurant. Hot coffee is served in toilet-shaped mugs. 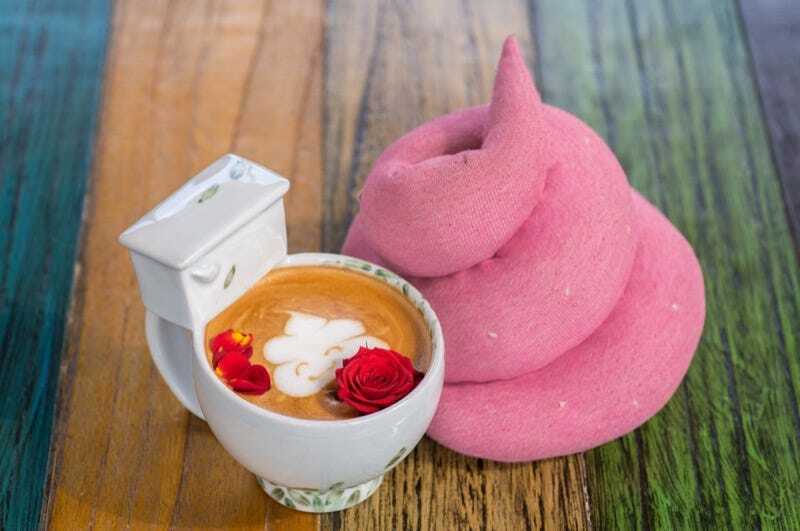 So go ahead and order the Rose Latte with poop art! There are also doodoo shaped scones. Because poop can be cute, too.